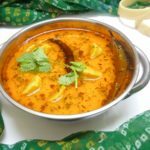 Dal makhani is a black gram preparation which has a wonderful creamy consistency and buttery flavor. 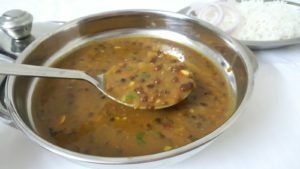 However, the fat that goes into dal makhani is more than we usually use in the dishes specially dals. 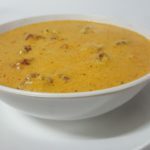 Low Cal Dal Makhani has similar texture and taste with low calories because of use of less quantity of butter and cream. The best part about Low Cal Dal Makhani is that it doesn’t pack your tummy quickly… as in it is light and easy on the tummy… you can enjoy larger portions. 1.Pressure cook black grams and red beans : Add grams and beans to a pressure cooker along with 2 bay leaves, 2 black cardamoms, 4 cloves, 2 cinnamon sticks, 4 cups of water and salt to taste. Pressure cook dal on high flame till one whistle thereafter on low flame for 20 minutes. 2. 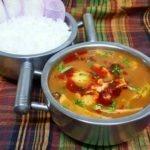 Discard whole spice and mash a portion of dal : Once the pressure of the cooker releases, (this is the wow moment of the recipe, the aroma of cooked dal and whole spices will make you believe that all is good) discard the whole spices. Take ½ cup cooked dal and mash it. Add the mashed dal to remaining dal. Whisk the dal well. 3. 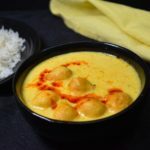 Add milk to dal : Add ¼ tsp cornflour to 1 cup milk. Mix it well. Add the milk to dal once it has cooled down. Make sure milk is at room temperature otherwise it might curdle. Adding corn flour to milk ensures that the milk doesn’t curdle. 4. Cook onions, ginger, and garlic for the tempering : Heat 2 tbsp oil. Add 1 cup chopped onions and cook till they turn brown. Add 1 tbsp chopped ginger and chopped garlic, each. Cook till the raw smell goes. 5. Add tomatoes and spices to the tempering : Add 1 cup grated tomatoes. Cook till the oil separates. Add 1 tsp red chili powder, ¼ tsp turmeric powder, and 1 tsp coriander powder. Cook for a minute. 7. 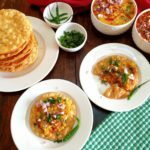 Bon appétit : Garnish with a handful of chopped coriander and ginger julienne, check the seasoning and consistency and serve with rice, parantha or naan. Yes, you deserve a lachchha parantha with the low cal dal makhani . Add grams and beans to a pressure cooker along with 2 bay leaves, 2 black cardamoms, 4 cloves, 1” piece of cinnamon, 4 cups of water and salt to taste. Pressure cook dal on high flame till one whistle thereafter on low flame for 20 minutes. 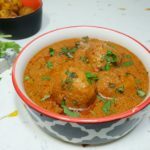 Once the pressure of the cooker releases, (this is the wow moment of the recipe, the aroma of cooked dal and whole spices will make you believe that all is good) discard the whole spices. Take ½ cup cooked dal and mash it. Add the mashed dal to remaining dal. Whisk the dal well. Add ¼ tsp corn flour to 1 cup milk. Mix it well. Add the milk to dal. Tip: Make sure milk is at room temperature otherwise it might cuddle. Tip: Adding corn flour to milk ensures that the milk doesn’t cuddle. Heat 2 tbsp oil. Add 1 cup chopped onions and cook till they turn brown. Add 1 tbsp chopped ginger and chopped garlic, each. Cook till the raw smell goes. Add 1 cup grated tomatoes. Cook till the oil separates. Add 1 tsp red chilli powder, ¼ tsp turmeric powder and 1 tsp coriander powder. Cook for a minute. Garnish with handful of chopped coriander, check the seasoning and consistency and serve with rice, parantha or naan.